Here is a tool that will make the finishing touches a lot easier and improve the quality of your craftsmanship - the flat nose plier with a tip. These pliers come with 1mm, 1.5mm or 2mm tips and are perfect for getting into tight spaces. These pliers will also guarantee the same size coil every time when you use these pliers to create your bend before looping - see photo. Use the narrower tips for smaller gauge wire such as 28 or 26 gauge and the 2mm tip for 24 gauge wire. For project that require a large number of wraps, these pliers will allow you to work quickly yet with consistent results. If you have more questions about these pliers, please give me a call! You can purchase these pliers online at BeadBee.com. Beading for Beginners: What Tools Do I Need? I think that beading is a great hobby because it is very scalable. What I mean is, that you can start very simple, with no tools at all, except a pair of scissors. Then as you get more involved, you can add more tools and supplies as needed. It is not necessary to go out and buy a whole bunch of tools and things that you don't need or don't know how to use. Simple is a great way to start dabbling with beading. All you need are beads in your favorite colors and stretch cord. A ruler is helpful so that you know how many beads to string on and you will need scissors to trim the stretch cord after you tie a knot. 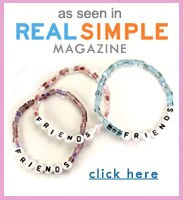 Then you will be able to string a fun bunch of stretch bracelets. It's a great way to spend a few hours with girlfriends, daughters, and sisters. Beginners - there is no need to be intimidated, beading is fun, so please enjoy it! There is a lot you can do with beads but take it slow and learn a little bit at a time. To start, I would recommend just a few basic things. It seems like a long list, but most of these items are relatively inexpensive and will make your beading experience easier and more enjoyable. Crimp Tool - compresses crimp beads, we have illustrated crimping instructions on our website, but most of the time there are instructions on the packaging. Bead Mat - this will pad your work space and keep beads from rolling off onto the floor. Bead Board - this is a board with a U-shaped groove. Lay your beads in the groove to design your piece before stringing. 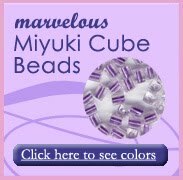 This allows you to arrange and rearrange the beads until you are happy with the design. Flexible Beading Wire - this is a quality, multi-purpose stringing materials that is great for stringing bracelets, necklaces, anklets and even making earrings. When using flexible beading wire, you will need crimps and a crimp to attach clasps and findings. Chain Nose Pliers - just a handy tool to have to give you an extra pair of hands or help with picking up items. Last, but not least - you will need BEADS!!! There are so many to choose from, half the fun is hunting for beads in uniques shapes and colors. Beading blogs, books and magazines are a great way to get ideas and teach you to visualize how beads will look together as you are designing. In a future blog post, I will talk about more advanced skill levels - Intermediate, Advanced & Obsessed! 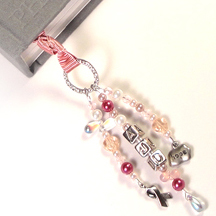 Beaded bookmarks are completely customized by the beads and the charms that you choose, so you can make each one truly unique. This design features beaded dangles at the end of satin ribbon. The satin ribbon is flat so it fits perfectly between the pages of a book. 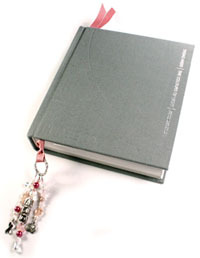 The book mark is decorated with beaded dangles that are attached to a large ring that connects the beaded dangles to the ribbon. You can have fun combining different types of ribbon with different combinations of beads and charms. We have created this design for Breast Cancer Awareness Month, but you can adapt this beaded book mark design for any occasion. 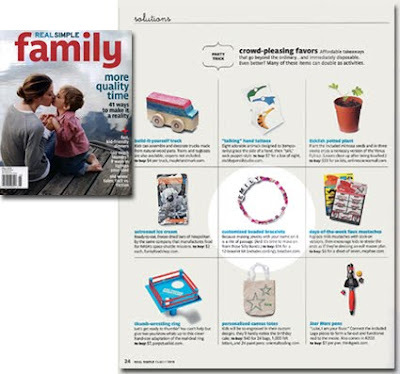 They are great stocking stuffers and wonderful gifts for teachers & book worms. Simple instructions to create this beaded book mark are available on our website with detailed photographs. All you need to know is how to use crimp beads and a crimp tool. We have been anxiously waiting for this episode to air so we can see how the EMHE designers have incorporated our beads into the Lutz Family's new home. We sent them all types of beads and we can't wait to see what they have done! After the show airs, we will post photographs, so stay tuned! Watch on ABC, Sunday, October 3, 2010, 8/7 central. After you see this episode, let us know what you think (post your comments)! Thanks!!! Hand made beaded keychains are simple to make and are a great activity for both kids and adults. Many people have created them as fundraisers or as gifts. 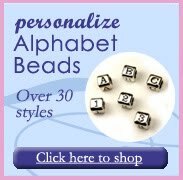 All you need are large hole beads and alphabet bead beads to spell out a special message. No tools are necessary except for a pair of scissors. For this blog, I wanted to focus on the beautiful Czech Glass Beads that you can find at Bead Bee. The reason I'm so interested in these beads is because they're linked with my heritage, and I wanted to find out a little bit of history on them. In essence, Czech Glass Beads were made from the ideas and demands of people all over the world. In the mid 1800s, Czech "sample men", as they called them, would travel the world trying to figure out what kinds of beads people wanted. They took back their notes and sketches to their home factories where the beads were produced. After a while, technological advances made it possible for Bohemia to mass produce pressed-glass beads. As a result, by the 1920s Czechs became the main bead exporters of the world. 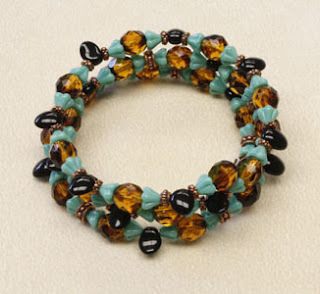 I created a memory wire bracelet using turquoise Czech flower glass beads, jet Czech petal beads and tortoise Czech fire polished glass beads. For added detail, I added antique copper spacers. I picked these colors because I haven't seen these colors used together on jewelry. This bracelet can be worn dressed down with a white t-shirt, jeans, and flip flops, or dressed up with that "little black dress" you save for special occasions. Please leave questions and comments to let me know what you think! Brianna is our guest blogger for this Spring/ Summer season - welcome Brianna! Click here to send Brianna message or leave a comment. Beading is such a nice hobby to share with your friends and family. 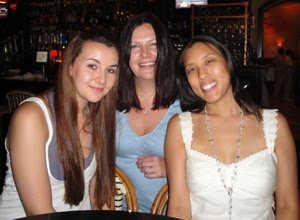 Last Saturday, my beautiful and awesome friends Brianna (our guest blogger), Bethany and I spent the afternoon beading and then went out for a delicious dinner. We talked, laughed and shared ideas. Bethany made a precious pink lanyard to wear at her new job. Brianna created a gorgeous Turquoise Flower Cuff Bracelet, see her blog post for details on making this bracelet for yourself (coming soon). Tell us how you have fun beading with your friends and loved ones, please leave a comment! This Thai silver rose pendant is absolutely exquisite. I wanted to create a sophisticated, garden inspired necklace featuring this rose in a cluster, surrounded by gorgeous gemstone beads that include blue topaz, pink topaz, chrysophrase and rhodonite. To create this necklace, attach beads and charms to a piece of chains. The rose pendant is attached to the chain with a jump ring and all of the gemstone beads are wire wrapped and attached to the chain as well. I chose beads that were no larger than 6mm so that the rose pendant would remain the focal point of the piece. When beads are wire wrapped and attached to chain, they dangle elegantly. Using this technique to attach beads to chain can also be used to create earrings. 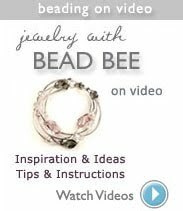 If you are new to wire wrapping and want to learn how to wire wrap top drilled gemstone beads (mostly tear drop shaped briolettes with the holes drilled horizontally across the top), click here to see illustrated wire wrapping instructions on our Bead Bee website.